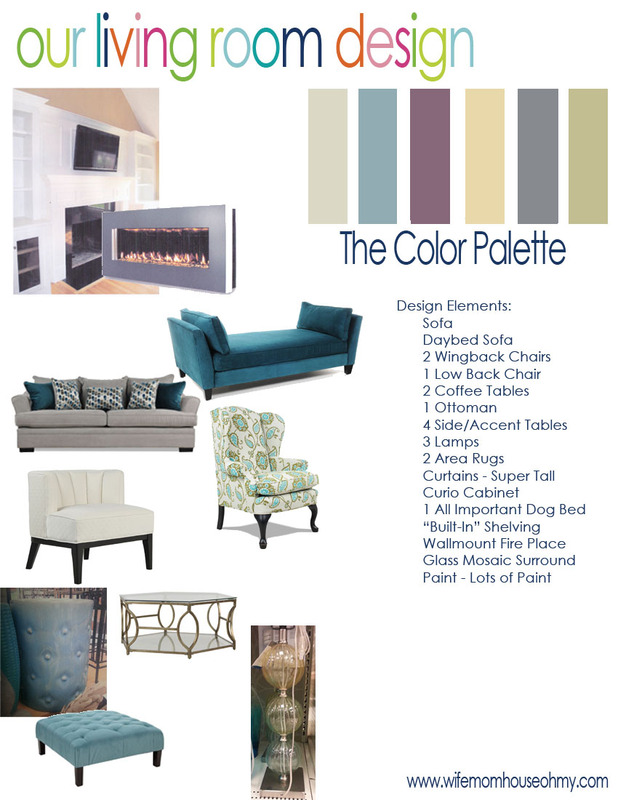 Here are the details for our living room design. So I love designing room interiors even if it does mean that I have to pull out the BIG eraser as I try different placements, looks, etc. 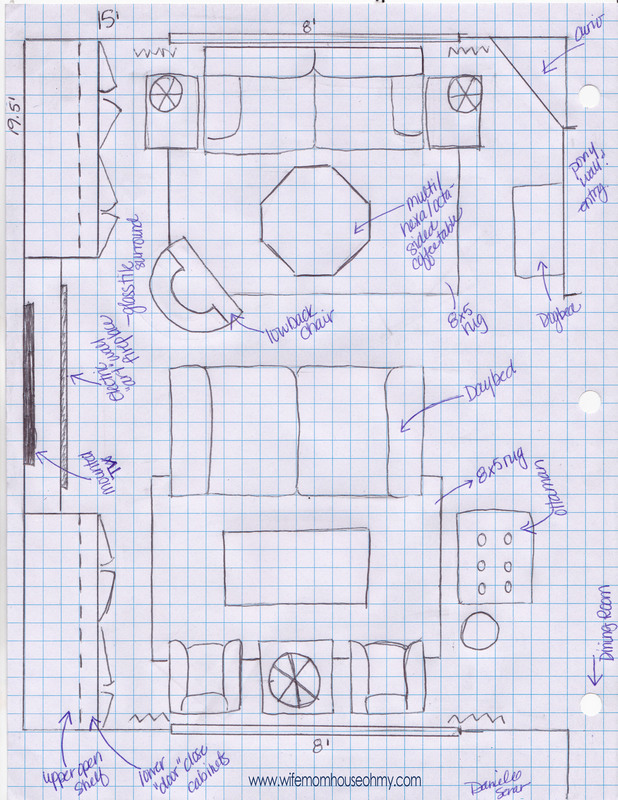 Designing our living room, keeping in mind that I have a budget (well I will have one even if I’m not sure right now what it will be), posed a real challenge on a lot of fronts. Our living room is basically a 15×20 rectangle that EATS furniture. And it has a big appetite. However, its not big enough to truly divide the room in to two distinct sitting areas with two separate focal points. And if I elected to create two seating areas, then I run the challenge of there will always be someone with their back to someone. Another part of that challenge…my husband insists there be a TV and everyone be able to see it. Size also creates a huge challenge when it comes to floor covering too. We have rich colored laminate wood flooring and you really don’t want to necessarily cover it up but at the same time rugs are needed. And try finding an off the rack 12 x 18 rug at your local Home Goods. I created two quasi sitting areas. On one side of the room I opted for a traditional sofa for maximum seating. On the other side, I went more for design rather than capacity and elected to flank two wingback chairs around a larger accent table. In the middle, I split the difference. I’m opting for a sofa daybed that has low sides and no back. People can choose to sit on either side and can participate in all conversation. Plus, there is no wall of fabric to block views. Additionally, I added a low back chair opposite of the sofa that can be moved as needed for TV viewing but also does not obstruct conversation. I balanced this in the other seating area with a tufted ottoman that serves the same purpose for mobile seating. For the floor size issue, I opted for two 8×5 area rugs. This is a pretty readily accessible size rug and can be more cost effective. It also helps define the two more intimate areas of gathering. I will however use identical rugs so that the space can also read as one open area as well. Like most of our house, we lack storage. The living room is no exception. Again, we have a big empty rectangle. Can we say rectangle? Our architectural detail and visual appeal is pretty much limited to the cathedral ceilings. Other than that we have a plain box. I’m lumping challenge two and three together because my solution was the same. Built in shelving….okay semi built in. Ideally this will consist of door closed bottom units with recessed open upper shelves flanking a fireplace (see image). The closed shelving will allow us to conceal entertainment components and the not so pretty of life like DVDs, records (yes we still own and play vinyl), family games, etc. The uppers can be for the decorative collectables we have as well as book shelving (in moderation). Either way, it creates a visual architectural detail that the room now lacks while adding vital storage. Along the same lines, the center of the unit will become both functional and aesthetically a focal point. The goal is to create a glass tile mosaic surround for a wall mount more contemporary art like fireplace framed by the mantel and cabinetry details. Above would be our TV which I plan on doing a two way mirror cover so it does not look like a TV when its not on. I already discussed room adjacencies and how they can effect inspiration but they also effect design. Our living room is visible from the upstairs balcony, the family room, guest powder room and directly adjacent to the entry and dinning room. This posed a challenge for the color palette as well as style of furniture selection. Color palette is kind of obvious why that would be a challenge. Furniture, on the other hand, may not be. Even though furniture can be distinct to each room, especially if you can close a door on the room, if it has an adjacent room or rooms that look into it, there needs to be some cohesiveness to the feel. Yes you can have more comfy casual furniture in the family room and more formal furniture in the dining room or living room. What looks off (unless expertly done in an eclectic home) is extremely modern contemporary casual furniture in one room that is visible from a room where the furniture is extremely formal, traditional and ornate. In order to solve the color palette issue, I simply pulled colors from all the rooms to create my palette. Since I know all are popular AND are often used together in fabrics, I am positive I can find one or two patterned fabrics that will contain them all. Pair these with solids and less color filled patterns, the room will blend with all the other rooms visible from the living room. For me furniture style was not as big a challenge as the rooms already pretty much have a transitional furniture style – simple lines in traditional forms. My solution was to stick with more of the same. 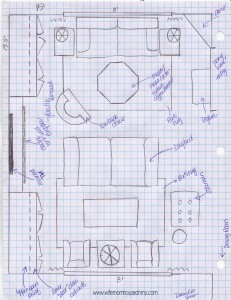 Here it is…the design for our living room.